This week French fashion house, Chanel, presented a new collection of sunglasses for fall 2018. The season brings subtle styles with classic shapes revisited in new materials and colors. This new Chanel eyewear collection is both bold and subtle, retro and futuristic, original and refined in this season's styles. With materials and motifs synonymous with the French fashion house, the collection uses fall-inspired shades such as brown, dark blue, bronze, champagne, burgundy, prune and silver. Chanel's iconic mask returns in two versions for fall 2018: one in a square shape with softened edges and one in a butterfly shape. 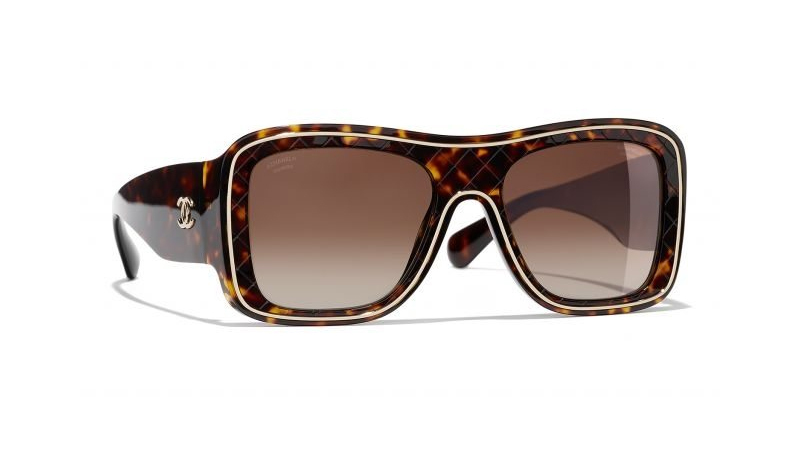 The frames have thick arms and are engraved with Chanel's iconic quilting motif. They are also threaded with a slim gold, silver or ruthenium metal line. The colors are in tune with the season, with brown, deep burgundy, dark blue, black, and brown tortoiseshell. Another Chanel classic, its frameless glasses, also returns in revisited styles this fall. This new generation features beveled lenses in cat-eye or aviator shapes. The lenses have a reflective mirror finish and are tinted in subtle yet audacious shades, including silver, bronze, champagne and pink. Three larger frame styles channel a more retro, 1960s vibe, with square, round and cat-eye shapes. These creations are finished in glossy acetate, with soft faceted angles, offering chic, feminine and concealing styles. The Chanel fall 2018 eyewear collection will be available in stores from June 2018.